The Holy Ghost is leading me this year to SERIOUSLY ask you to deal with YOUR FOUNDATION because ALL YOU WILL DO OR HAVE DONE ON EARTH IS BUILT ON YOUR FOUNDATION (SEE MORE IN THE WAR AGAINST HAMAN-13 BOOKLET LATER)! There are Good and BAD (EVIL) foundations! A bad FOUNDATION may even carry you for many years, BUT IT WILL CRASH LATER IN LIFE and GREAT WILL BE THAT CRASH! in fact, it will be a SUPER CRASH! God forbid! Do you now see the importance of FOUNDATIONS? Psalm 11:3 asks: “if the foundations be destroyed, what can the righteous do?” catch this power bullet from Isaiah 54:11- ‘O thou afflicted, tossed and was tempest, and not comforted, behold I will lay thy stones with fair colours, and lay thy foundation with sapphires. 3. Not comforted (from war to war, from tears rose tears, etc; No peace and no celebration). Afflictions without end are the characteristics of any evil foundation! The LORD is saying that in this 21 day fasting program and indeed this year, he will bring you out of ever foundational affliction or storm. Watch this: "Behold, I will lay thy stones with fair colours and lay thy foundations with sapphires." That means God will beautify and decorate your foundation and make you a sign and a wonder this year. It is your year of foundational operation, foundational evacuation, and foundational decoration. Determine to complete this fast and sow your FOUNDATION ON FIRE SEED also called the CHANGE OF GARMENT. DECORATION SEED in this fasting program and be at the WORLD ANOINTING CHANGE OF GARMENT DECORATION NIGHT with your prophetic dress /garment /shirt which you will tear that night (not the one you wore to the program)! Get ready! And pray the DECORATION PSALM which will be sent to you after sowing! WHATSAPP AND EMAIL ARE BETTER AND CONTAIN FULLER PRAYERS than just texts! See page 29 for your account details. This is your year! TODAY IS DAY 17 OF THIS FASTING PROGRAM! Turn to page 75 of the "WAR AGAINST HAMAN-13" booklet and pray today's prayers. 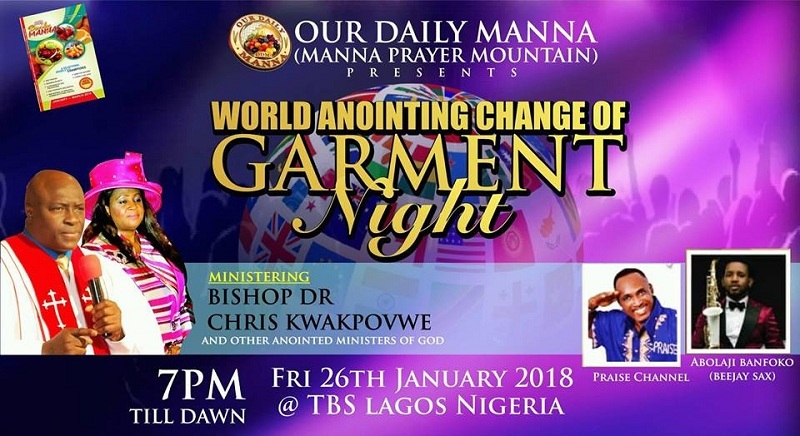 Then be at the TBS Lagos on Friday January 26th 7pm for the change of garment world anointing decoration night! Thank God for today's word and pray as you are led! 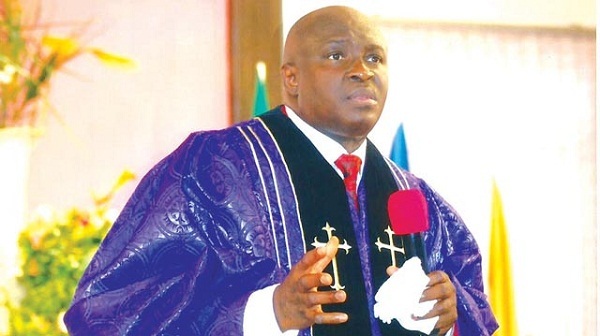 LORD, visit and operate my FOUNDATION this fasting program and beyond in Jesus name. Next Post:ODM January 2018 Day 23 – THEY SHALL HEAR A NOISE OF WAR!